November provides our gardens with displays of fiery shades of autumnal colour, given to us by our deciduous trees and shrubs. As the leaves fade and fall, the display gets brighter and more intense with the colour of the leaves often carpeting the floor too. There’s nothing quite like an autumnal walk wading through the leaves whether that be in a cultivated garden or “in the wild”. Either way you are still likely to enjoy the best of what the season has to offer. Cercis canadensis ‘Forest Pansy’ is a fantastic multi-stemmed tree that can be used in even the smallest gardens to provide height, structure, colour and seasonal interest throughout the year. There’s not much to dislike about this versatile little tree and the RHS seems to agree by giving it an award of gardening merit. Its purple, heart-shaped leaves are not the only ornamental quality of this tree. It forms small crimson, pea like spring flowers that cling to bare wood, seemingly dangling in mid-air as they are unsupported by any foliage and are attached directly onto the stem of the tree. The foliage turns a lovely yellow in autumn and the zig/zag, twisting effect of the winter stems provide a different structure to most other deciduous shrubs in the winter garden. There are six species of Cercis from temperate regions of the northern hemisphere. Cercis canadensis is found in south-east Canada, the eastern United States and north-east Mexico. It has been grown in Britain since 1730. Forest Pansy is by far the most common form grown these days. 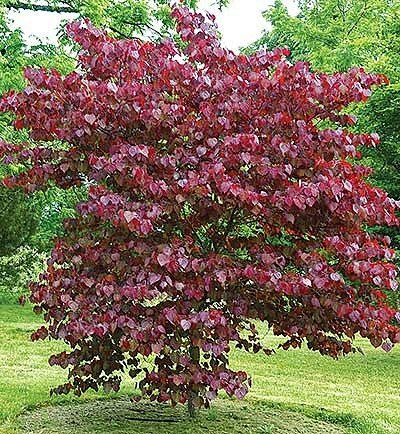 For best results, Cercis is best grown in fertile, moist but well-drained soil, in sun or partial shade. Hardiness is not a problem with Cercis canadensis, as this species comes from areas where winters are cold and conversely, summers are hot. Cercis are best planted young and once established, these members of the legume family hate being moved. Cercis is best planted as the main focal point of a border or as a specimen in a lawn, however underplanting with spring flowering perennials like hellebores or with a shrubby back drop of sarcococca confuse. By doing this you can extend the season and provide an extra blast of colour before the flowers and foliage arrive in spring. Once the foliage covers this great little tree you have a dramatic purple back drop for all your summer flowering perennials. • Part prune roses to prevent windrock. • Continue to tidy borders if weather permits. • Final cut for lawns if no frosts. • Cutback spent foliage and flowers of herbaceous perennials. • Leave the seedheads of grasses like Miscanthus to provide winter structure. • Continue to lay turf for new lawns – avoid frosty days if possible. • Remove surplus dead leaves from ponds. • Complete planting of bulbs. • Mulch borders – especially borderline hardy perennials. • Plant bare root shrubs and roses. • Prune long stems of roses to avoid windrock. • Take hard wood cuttings of roses and other deciduous shrubs. • Keep off lawns in wet and frosty weather. • Begin winter pruning of fruit trees. • Plant fruit trees, soft fruit and cane fruit. • Apply grease bands around trunks of fruit trees to protect from winter months. • Apply a good layer of compost / manure to bare areas of ground. • Protect salad plants under cloches/ fleece etc. • Clear spent old plants from compost to be disease free.